We’ve been talking about TBEX Europe in Girona for so long that it’s hard to imagine that it’s almost here. Yesterday we shared some of the bloggers who will be speaking at TBEX Girona, and we have more to confirm in the coming days. Now, to get you enthusiastic for your time in Spain, we have an infographic to share with you. 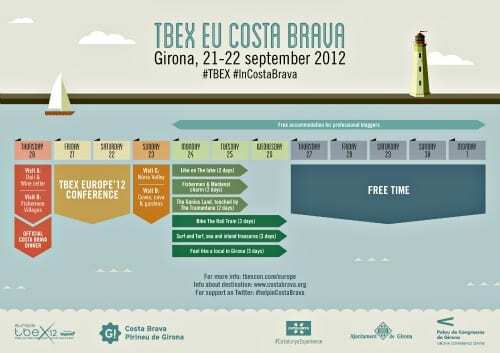 Use the dates and events on the infographic to help you plan your time in the Costa Brava area. Thursday, September 20th – A couple of tours during the day and the kick off Costa Brava dinner. Sunday, September 23rd – A choice of tours. Monday, September 24th – A number of additional tours are schedule to depart. Thursday, September 27th – Monday, October 1st – Free time. That’s a lot of dates, a lot of events, and a lot of time you can spend in Spain. We can’t give you the full scoop. . . yet. . . but we’ll be announcing these events in detail starting tomorrow. We have options that will allow you to spend nearly two weeks in Spain, networking and learning at TBEX, and then discovering the great stories to be found both in Girona and in the Costa Brava area. We know you’ll love the area and will find plenty of stories to share with your readers; we know your readers will love your stories as well. And it’s all brought to you courtesy of the Costa Brava Tourism Board and its partners. BUT – these events are only available to registered travel bloggers. If you’ve put off registering for TBEX Europe, don’t put it off any longer. Registration is still available for $100 (for bloggers) and will give you the opportunity to take advantage of all the special offers that are available. What do YOU want to see in Costa Brava? Every time you guys post something new, I get more excited! Can’t wait to hear more details. We’ll have announcements all week long, so keep reading. Looking forward to seeing you next month. Will you (please, please!) have something like this for Toronto? We’ll be working with Visit Toronto to make sure our program is just as exciting. Hope you’re planning to be there! It would be great to get that information as early as possible to make travel plans from Europe easier and cheaper (The earlier we book the flight the cheaper it will be). We’ve already registered for Toronto and are looking forward to this very much. We try our best to get things our as quickly as possible. When working with a number of partners and agencies, it sometimes takes awhile for all the details to come together. We’re sensitive to the need to make travel plans as cheaply as possible (we’re travelers, too), so we’ll do everything we can to get information out as early as possible. Is it too late? I want to go! Not too late at all. If you click on the red box at the top of this page (it says buy tickets for Girona, Spain) it will take you to the registration page. Tickets are $100 and full of value. Hope to see you in Girona. Looking forward to it so much! Just wish there were more places for the pre and post trips! There are still spots left on one of the post-conference excursions. Check it out.